The Radisson SAS Resort, Sharm El Sheikh is on the southern tip of Egypt's Sinai Peninsula, on the shore of the Red Sea, one of the world's fascinating natural seascape environments. The resort is set on 30 acres of landscaped gardens with waterfalls, rivers and 22 individually designed bridges. The resort area offers a variety of 129 rare tropical plant species. Sharm El Sheikh is scuba diving paradise and is ideal for excursions and trips. Take a desert safari (10 kilometres), visit the iconic St. Katherine's Monastery (150 kilometres) and pay your respects to Moses Mountain (150 kilometres). The protected area of Mangroves is just 10 kilometres from the hotel and definitely worth a visit. The resort offers 329 beautifully appointed guestrooms and suites designed in Arabic, Tropical and Maritime themes. In addition, we offer Marine Club rooms that come with special amenities and can accommodate three adults; or two adults and two children. Non-smoking rooms are available upon request. Free Broadband including wireless Internet access is available in the hotel. All Radisson SAS Resort Standard rooms are beautifully decorated in Arabic, Tropical or Maritime themes and are equipped according 5* standards , individual climate control, in room safe and satellite television. 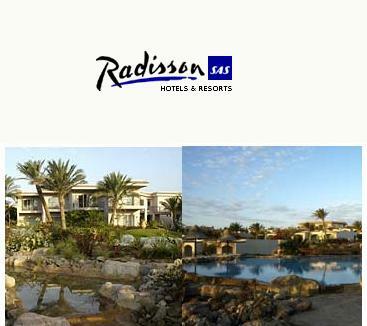 Radisson SAS Resort also offer Superior rooms that come with great views of the landscaped gardens and the sea. Marine Club rooms come with a prime sea view and offer several additional amenities such as coffee and tea making facilities, Super Breakfast buffet (in the restaurant or room service), fruit basket upon arrival, bathrobe, slippers, dental and shaving kit and a complimentary welcome drink. Radisson SAS Resort offer one bedroom and two bedroom suites, appointed to offer luxury and comfort. Junior suites come with one bedroom and have a separate sitting area and bathroom. The next step up are Radisson SAS Resort Royal Suites which house one or two bedrooms, a separate dining area, luxurious bathroom and a guest toilette. All suites offer stunning views of the Red Sea and come with Marine Club amenities. Welcome to Olivos, Radisson SAS Resort buffet restaurant that serves an excellent breakfast, lunch and an every day themed dinner buffet. Observe Radisson SAS Resort skilled chefs preparing delightful specialties at Radisson SAS Resort live cooking stations every evening. See Radisson SAS Resort skilled chefs prepare delightful Mediterranean specialties with the freshest of ingredients. Next to the wine cellar overlooking the waterfalls, La Cascasta offers sumptuous homemade pastas, antipasti and Italian specialities alongside a fine choice of Italian wines and spirits. Serving delectable French cuisine for dinner, La Brasserie offers an elegant ambience to go with refined cuisine. Your meal will be served with carefully chosen wine and the service, we assure you, will be impeccable. Ideal for banquets, weddings and corporate celebrations, the King Tut Ballroom can accommodate up to 280 guests and is spread over 272 sq metres , it is column free with private entrance and foyer. From theme parties to banquets, to weddings in the gardens and terraces, we can accommodate any type of event and offer you a customised solution that works best for you and your budget. In keeping with the delightful climate of the Red Sea, our resort offers a multitude of activities and recreation facilities to ensure that you stay fit, relaxed and limber throughout your visit. The Abracadabra Club is for Radisson SAS Resort little guests from the age of 4-12 years.a children's pool and a play area, and is the ideal place for your children to have a great time while you catch up with some well-deserved relaxation.